This is a bit overdue since it occurred about two weeks ago. Listen, I've been busy. My belly button appears to be collecting an alarming amount of lint as I've been getting older and I'm starting to get concerned. The scientific research has been very time consuming and fairly inconclusive. But that's a post for another time once my graphs are finished. So let's discuss my trip to Yankee Stadium. I don't make it to many MLB games since I live in New Orleans and try to avoid sunlight like the inside of a depressing Irish bar. I'm working on some uncharted levels of paleness. Yet, somehow, I stumbled my way into a new girlfriend who is a Yankees fan. Which is at least three rungs above "I hate baseball" on my ladder of compatibility chart. Not ideal but I can work with it. Plus she was a manager at the Times Square Hard Rock and wanted to go to a game, visit friends, etc. I'm in. I haven't been to New York since I was eight and lived on Long Island for a year. So we're off to New York, like the hip, jet setting couple we are in my mind. As it turns out, I don't like airports and subways and knowing who Mos Def is only made me hip a decade ago (debatable). After living in Atlanta and New Orleans for the past 20 years, I also forgot that the north isn't always 90 degrees in May. I might have underpacked for cold and rainy weather. 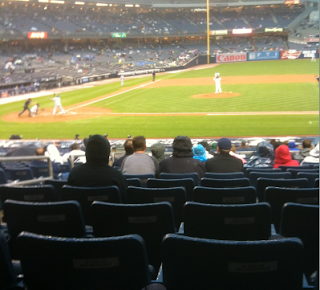 But the girlfriend comes through with amazing tickets for the May 21 game between the Yankees and Royals. 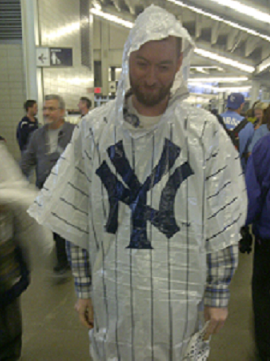 I enjoyed a few adult beverages before the game and then, much to her delight and resident Yankees fan Derwood, she stuck me in the Yankees poncho featured above. That was some bad mojo, though, as the joke was on her. Putting me in Yankees gear clearly jinxed the team. The Royals blanked the Yankees 6-0 on home runs from Mike Moustakas and Jeff Francoeur plus six shutout, eight strikeout innings from Felipe Paulino. The seats were fantastic and I was allowed the privilege to order an once of Crown Royal for $13 from a server/usher. We were about 20 rows up on the first base line as you can see in this pic from the pitch before the Moustakas home run. I didn't walk the entire stadium but it was an important baseball experience. If for no other reason, I needed to see first hand how the crowd could turn back and forth on A-Rod in an instant. I hope all of his cash can fix his inevitable nervous breakdown. Side Note: As a comedy nerd, I had to check out a show at the Comedy Cellar. That Wednesday, we went to an 8:00 show featuring Colin Quinn, Tom Papa and Robert Kelly. In an unexpected surprise, Aziz Ansari (Parks and Rec) showed up to work on 15 minutes on material. But I never got the opportunity to ask his about the awesomeness of Ken Tremendous.